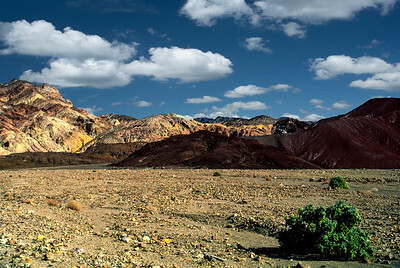 Death Valley, in California, is one of my most favorite spots to visit and photograph. 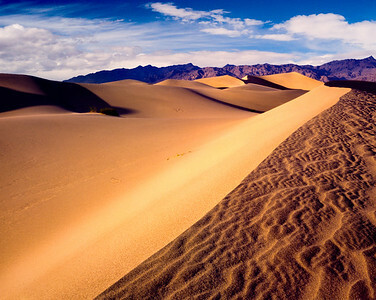 To me, Death Valley combines the ingredients of beauty, tranquility, power, quietness and loneliness. 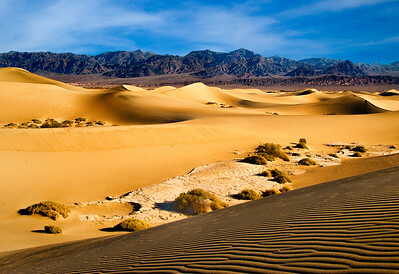 Death Valley is a place where I feel one can truly commune with God, and contemplate His glory. It reminds me, a little bit, of the many places and much of the terrain where Jesus walked when he walked upon the earth. 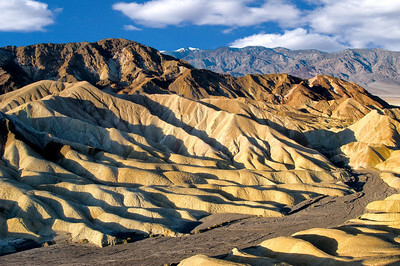 Death Valley is nothing like what most people envision when they hear its name. Most people, having never seen its beauty, think of it as a vast wasteland of desert sands, devoid of living things and littered with the dry bones of man and beast who dared to enter. That mental vision couldn’t be further from the reality. Its diversity of terrain and beauty seem almost limitless. I hope that in viewing these photographic images you will see what I mean. "Sand Dunes and Mud Flats"
View from Dante's View atop the mineral rich Black Mountains, looking north across Badwater Basin in Death Valley National Park, California. 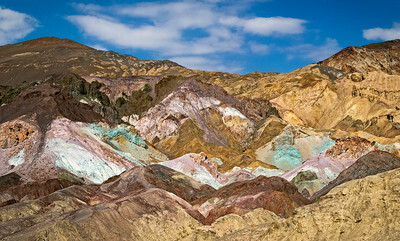 The diversity of mineral deposits at the 'Artist Palette' creates a kaleidoscope of color. 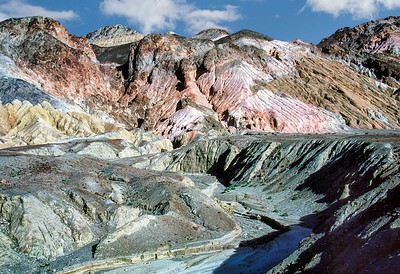 Artist Palette is in the Artist Canyon area of Death Valley National Park, California. 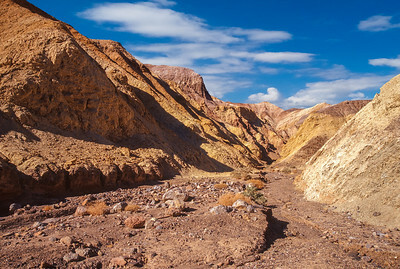 Dry wash leading out of Artist Canyon in Death Valley National Park, in California. 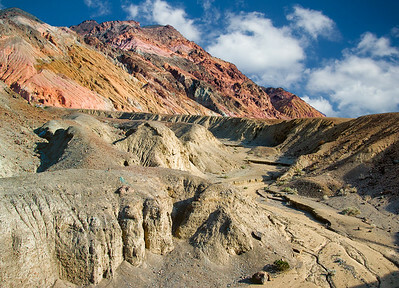 The multitude of colors result from many types of mineral deposits. 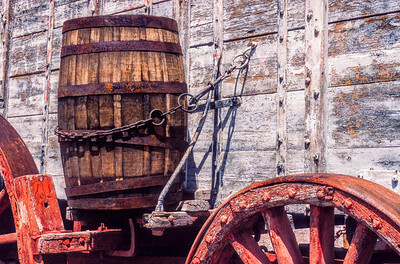 A 20 Mule Team Borax Wagon with a water barrel at the Harmony Borax Ruins in Death Valley National Park, California. 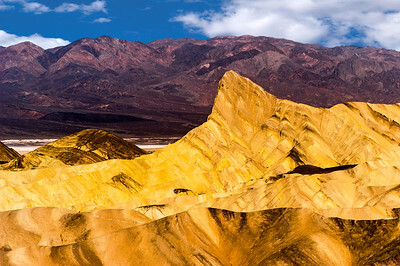 The golden glow of sunrise on Manly Beacon in the Badlands Area of Death Valley. 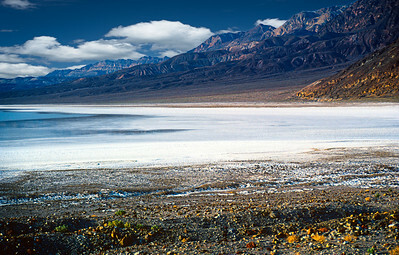 Looking north-west from Zabriskie Point, across Badwater Basin toward the Panamint Mountains, in Death Valley National Park, California. 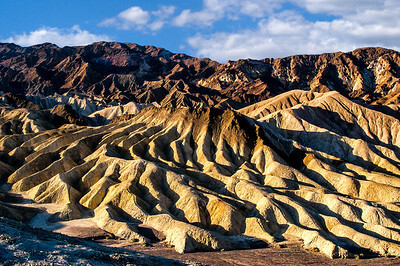 Early morning sun on Badlands Wash in Death Valley National Park, California. 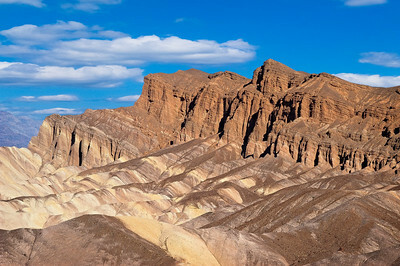 Viewed from Zabriskie Point. 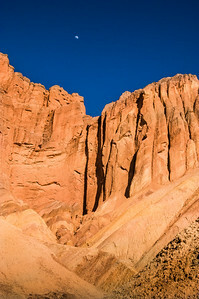 The moon is rising in the deepening sky over the sandstone cliffs of Death Valley, even as the cliffs are painted in the warm glow of a waning late afternoon sun. 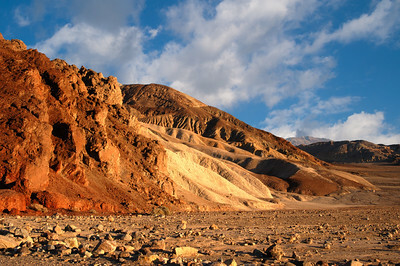 The late afternoon sun intensifys the soil and rock earth tones near the mouth of Titus Canyon, in Death Valley National Park, California. 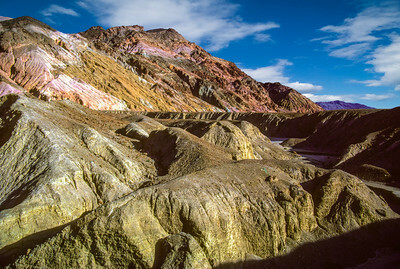 "Blue Trail in Titus Canyon"
The apparent blue tint, on the rocky soil at the bottom of this desert wash, comes from the light of the deep blue sky, pentrating into the shadow areas devoid of direct sunlight, and reflecting back. 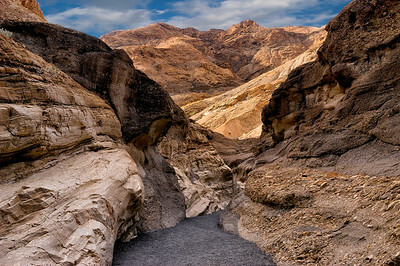 Titus Canyon Wash is in Death Valley National Park, California. 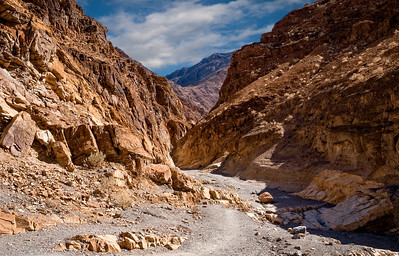 Titus Canyon wash in Death Valley National Park, California. 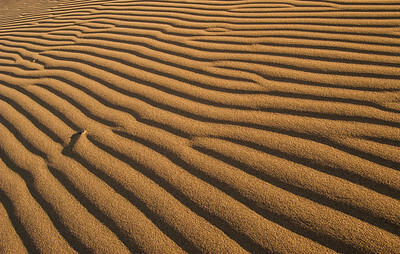 "Ripples in the Sands of Time"
Ripples in the sands of Mesquite Flat Dunes, near Stovepipe Wells in Death Valley National Park, are created by the ever present winds and accentuated by the early morning sun. 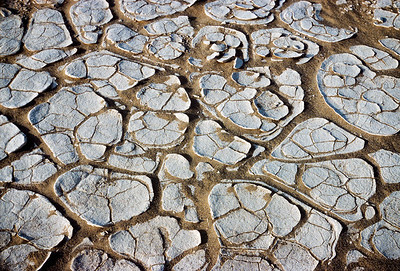 "Death Valley Dry Wash #2"
A dry wash near the valley floor in Death Valley National Park, California. 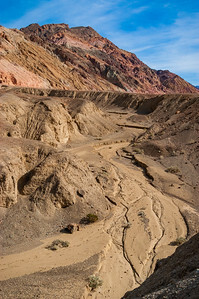 "Wash From Artist Canyon #2"
A desert wash near Artist Canyon in Death Valley National Park, California. 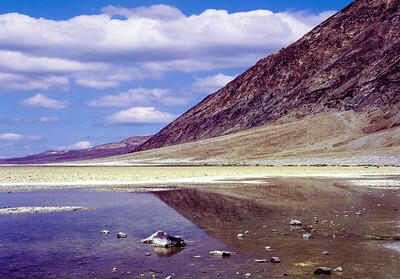 Mud Flat in the Mesquite Flat Dunes, near Stovepipe Wells in Death Valley National Park, California. 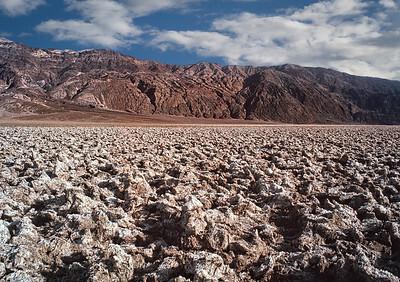 This is the Badwater area in the Badwater Basin, in Death Valley National Park. 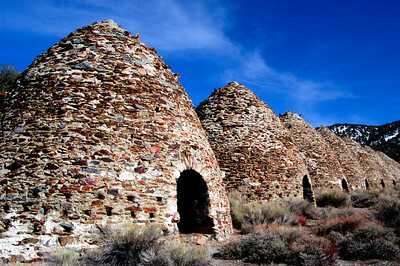 At 282 feet below sea level, it is the lowest elevation in North America. 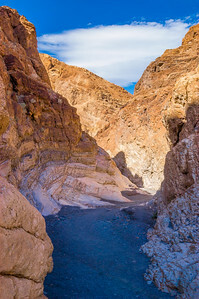 A wash at the entrance to Artist Canyon in Death Valley National Park, California. 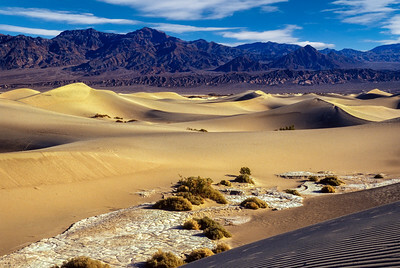 Mesquite Flat Sand Dunes near Stovepipe Wells in Death Valley National Park, California. 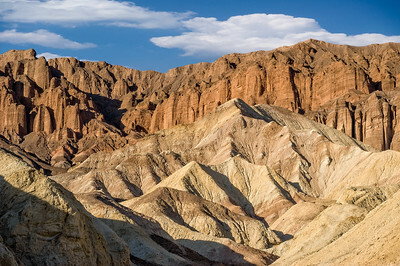 The juxtaposition of the different minerals, layers, textures and hills makes for an interesting study of the topography in Death Valley National Park in California. 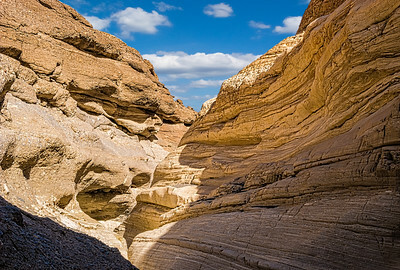 Layers of soil and rock along a dry wash in Mosaic Canyon are polished by the flash flooding of the very infrequient, but often violent, rain storms in Death Valley National Park, California. "Exiting a Titus Canyon Wash"
View on the way out of a dry wash in Titus Canyon, in Death Valley National Park, California. "Sand Dunes and Mud Flats #2"
The early afternoon sun glistens off the Mesquite Flat Dunes near Stovepipe Wells in Death Valley National Park, California. 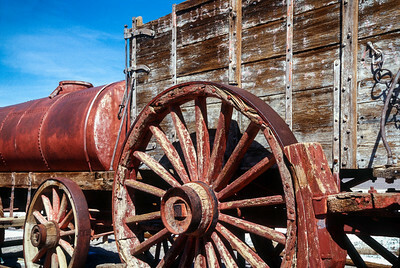 A 20 Mule Team Borax Wagon with near the Harmony Borax Ruins in Death Valley National Park, California. 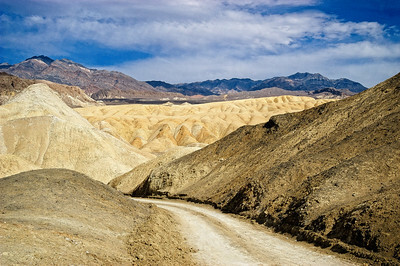 A 4X4 trail in the heart of Death Valley National Park in California. 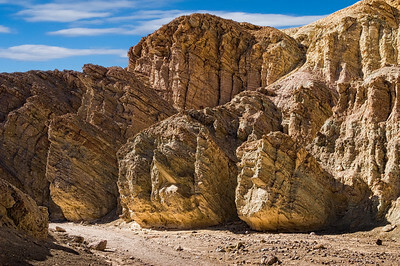 A dry wash below Artist Canyon in Death Valley National Park, California.